Marine Drive is possibly Mumbai's best known road. This 3 kilometer stretch of boulevard, with Girgaum Chowpatty beach at the northern end, curves around the coast. Its feature is a seaside promenade where people flock to catch the evening breeze. Marine Drive is also referred to as the Queen's Necklace because of its string of sparkling lights, reflective of a row of jewels. View it from the rooftop Dome bar at the Intercontinental Hotel while sipping on a sunset cocktail. Where: Marine Drive links Nariman Point to Babulnath and Malabar Hill, in south Mumbai. One of the top attractions in Mumbai, Girgaum Chowpatty (also referred to as Marine Drive Chowpatty) is a beach that's famous for its snack stalls. People meet there in the evenings to watch the sunset over the Malabar Hill skyline, and munch on their favorite bhel puri, pani puri, and pav bhaji. The beach really comes alive during the annual Ganesh Festival, when some of Mumbai's biggest idols are immersed in the water there. Where: Girgaum, at the northern end of Marine Drive, in south Mumbai. Shivaji Park, the largest park in Mumbai, has a long history. It was created in 1925, during the reign of the British Raj. The Britishers named it in honor of the 17th century warrior king of the region, Chhatrapati Shivaji. A large bronze statue of him riding his horse can be found to the north of the park. The park has hosted many gatherings of freedom fighters, and was the base for the struggle for the formation of the state of Maharashtra after Independence. These days, Shivaji Park is the perfect place for people watching. On weekends, it can be difficult to find a spare place on the bench that runs around the edge of it. People of all ages come to the park to play sport (especially cricket) and other games, exercise, or simply relax and chat. Plenty of snack stalls are there to feed hungry tummies. Where: Dadar, in central south Mumbai. 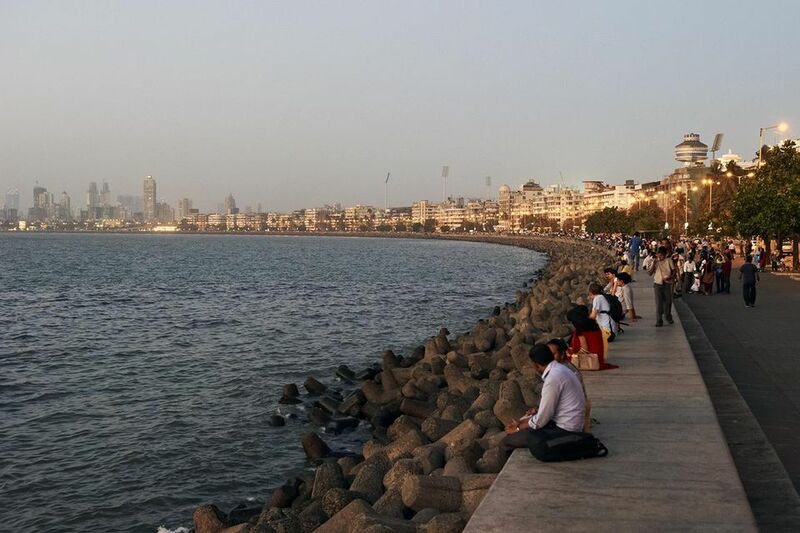 Worli Seaface is another of Mumbai's renowned promenades where people like to go for walks and sit in the evenings. It's one of the top places to experience the monsoon in Mumbai, as huge waves thrillingly rise up and onto the roadside during high tide. The Worli Seaface also offers a view of the Bandra Worli Sealink, which starts a little to the north of it. Where: Worli, in central south Mumbai. Bandra Bandstand got its name from the old glory days of bandstand culture, when bands used to provide entertainment by playing outdoors there. It's characterized by an amphitheater set high on a hill above the ocean, and the remains of a Portuguese fort built in 1640. Popularly known as a lover's point, at low tide, young couples like to sneak out onto the rocks below to spend some time alone. Unfortunately, some are known to get trapped there when tide comes in, and have to be rescued. Famous Bollywood actor Sha Rukh Khan's house, Mannat, is located opposite the old Sea Rock hotel at Bandstand. Where: Near the landmark Taj Lands End hotel, Bandra West, Mumbai. North of Bandra Bandstand, you'll find Carter Road promenade. It's a relatively new one kilometer stretch of seaside promenade, opened in 2002, much of which is bordered by mangroves. Projects to beautify it have been ongoing over the years. Apart from the walkers and joggers, Carter Road also attracts the cafe crowd, as it has a culinary strip full of fashionable restaurants and coffee shops. Numerous Bollywood stars live in the area. There are also fishing villages at both ends. Where: Near Pali Hill, Bandra West, Mumbai. On Sunday afternoons, Juhu beach becomes carnival-like with everything from market stalls to monkeys. It's crazy and crowded. Balloons, kites, trinkets, sand sculptures, and snacks make it a fun beach day out -- Indian style! Juhu beach is located in one of Mumbai's most exclusive suburbs that's home to many celebrities. Stay at one of the top beachfront hotels in Juhu to have a relaxing time, away from the hustle and bustle of the city. Where: Juhu Tara Road, Juhu, Mumbai. Sanjay Gandhi National Park is the only protected forest to be located within the limits of a city in India. It receives thousands of early morning walkers, as well as families and couples during the day. The various attractions include trekking, a toy train, boating on the late, and a tiger and lion sanctuary. However, what's really worth seeing are the hand-cut Kanheri Buddhist caves. There are 109 of them in various sizes, scattered over a hilltop and carved out of volcanic rock. The largest has a deep chamber for worship and towering sculptures of Buddha. Where: Near Borivali East train station, 40 kilometers (25 miles) north of Mumbai city center. Man-made Powai Lake was created by the British in 1799. The lake is rich in biodiversity including several types of migratory birds as well as crocodiles. Although it had been neglected in recent years, extensive restoration and beautification works have been carried out. The lake now has a two kilometer long paved jogging track/walkway, musical fountain, and children's play area. Powai Lake is bordered by Hiranandani Gardens, a planned township, on one side and the luxury Renaissance Hotel on the other. The Renaissance offers lovely views and popular Sunday brunch. Where: Powai, in the north eastern suburbs of Mumbai.